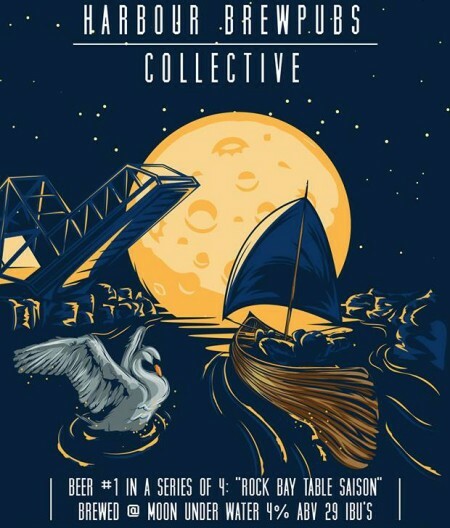 VICTORIA, BC – A quartet of brewpubs in Victoria – Canoe Brewpub, The Moon Under Water, Spinnakers Brewpub, and Swans Brewpub – have announced the first in a series of beers being released under the Harbour Brewpubs Collective label. Rock Bay Table Saison is a 4% abv and 29 IBU saison brewed at the Moon Under Water using ADH 527 hops, a new hop strain that is said to be similar to Azzaca. Rock Bay will be going on tap tomorrow (May 18th) at the four participating brewpubs, as well as several select beer bars in British Columbia. Further beers in the series brewed at the other three locations will follow on a monthly basis throughout the summer.